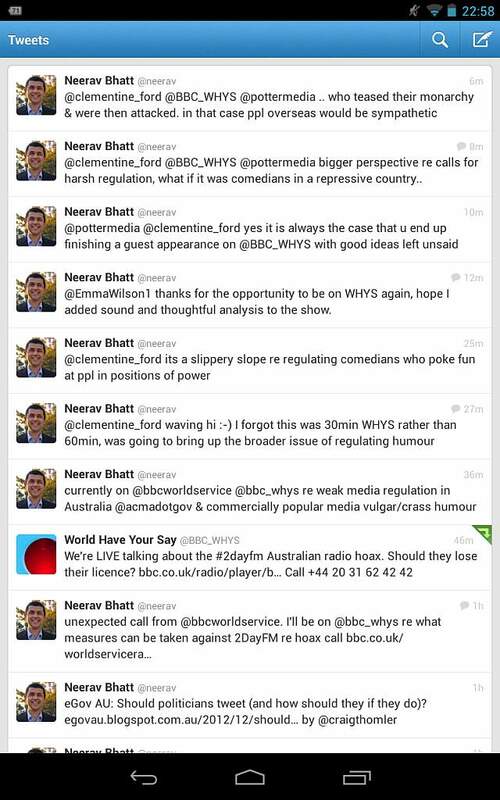 I unexpectedly got called yesterday evening by BBC World Service Radio because the producer of World Have Your Say wanted to discuss Australian media regulation in the aftermath of 2DayFM’s UK hoax call. The topic to be discussed this time was: what you want the Australian regulator to do about 2Day FM who broadcasted the royal hospital hoax call, should they lose their licence? The guests on yesterday’s show were Clementine Ford a Melbourne based writer, media graduate Adam Marsters and myself a Sydney based freelance journalist. I don’t really see that there will be any useful result from the Australian Communications and Media Authority (ACMA) inquiry into 2DayFM. If I did a word association for ACMA it would be “weak” and “toothless”. Their track record for actually doing anything if people in the media make slurs against ethnic minorities, women or other groups is usually a light slap on the wrist and making the media person apologise. There’s an example right now where one of the more powerful conservative radio commentators has been asked to apologise again on radio for comments that he made in the past because it was felt that he didn’t really mean the apology, well he’s not going to mean the apology the second time around either. The inquiry will focus on the license holder 2DayFM and the presenters of the show which is in the spotlight because they are the ones ultimately responsible. The broader point that needs to be made is whether its egregious conduct by radio or a newspaper etc the audience needs to take some responsibility. There’s a reason why the stations are making prank calls which are juvenile or infantile in their humourous nature, it’s because people listen in large numbers and they make good advertising money out of it. The only real regulation/punishment that these media outlets which cater to the lowest common denominator understand is if advertisers withdraw their spending and the audience shifts their attention elsewhere. Realistically whatever ACMA does will result in an apology, perhaps a voluntary cash sum donated to the victim by the media organisation for PR purposes, maybe sack one or two people and some time later similar poor behaviour will happen again. You can listen to the show as an MP3 audio file. Either the 24minute show as broadcast or just the edited excerpt of the show with the host introduction and all the segments where I speak. Since the BBC delete their podcasts after 7 days I have hosted copies on my site.